2013 has been a very turbulent year for Egypt - find out which reports were most read on Egypt Business Directory. 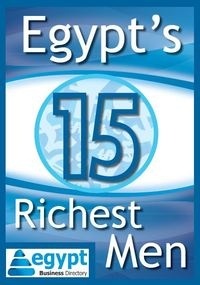 <p>A compilation of the background, success stories and wealth of Egypt’s 16 richest men. <p>With over 33 million Egyptian internet users, online marketing and advertising has been receiving too little attention from companies in Egypt. The future, ladies and gentlemen, lies online. Learn how to enhance your online presence and boost your sales. <p>The power of Egypt lies in its women – a popular point that was raised during the 25th of January revolution and after. Which Egyptian women have the most influence on public opinion and highest level of intellect? <p>Egypt’s second-largest foreign currency earner is tourism – or at least that was the case before the 25th of January revolution. This report gives a brief about the Egyptian tourism sector and about the eight hotel brands that made it big in the past years. <p>If you missed the Money and Finance 2013 Conference, download this report to read what Egypt's Ministers of Tourism, Housing, Utilities and Urban Development and Industry and Foreign Trade revealed about Egypt's economic development strategy in 2013. <p>Egypt has a mobile penetration of 115%, while the internet’s contribution to the country’s GDP lies at 1%. Things are not always the way they seem and numbers sometimes speak louder than words. This report reveals what the country’s ICT sector numbers mean. <p>Egypt had taken several hits since 2011 in its tourism-sector. The numbers are more confusing than accurate and news-reports have been contradictory. In this report, the Minister of Tourism and several experts provide their insights on which challenges the tourism-sector faces and where the solutions lie. <p>This report is all about the challenges faced by the real estate sector in Egypt with a special focus on industrial real estate. It identifies key investment opportunities in Egypt, and what can be done to promote this specific sector in the turbulent times which Egypt is witnessing. <p>This report summarizes numbers, statistics and plans concerning Egypt's fiscal policies and its economic recovery, as presented by of the Minister of Finance Dr. Ahmed Galal, Minister of Planning Dr. Ashraf El-Arabi, and Minister of Investment Osama Saleh.